The spell of dry weather, with bright blue skies and wonderful winter sunrises and sunsets seems to be coming to an end this week. 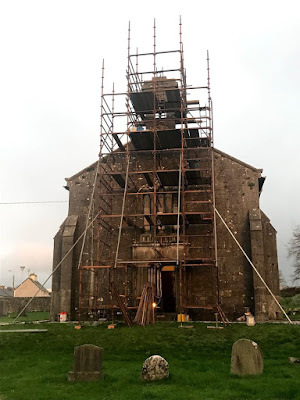 As I strolled from the Rectory in Askeaton to buy the daily newspapers this morning [16 January 2019, I was caught in a sudden, intense rainstorm. I calculated I would get as wet if I turned back as I would if I continued on to see the work being carried on at Saint Mary’s Church. The scaffolding is now in placed and secured at the west end of the church as builders and engineers try to assess the work that needs to be done on the façade to secure the church for future generations in the parish and in the community. On Tuesday afternoon, I climbed the scaffolding to see the work at first hand. It was almost sunset, and a caught a beautiful view of the landscape to the west beyond Askeaton, stretching across West Limerick and probably into North Kerry. Behind me I could see the Rectory, and to the north there were views across the Shannon Estuary and into Co Clare. But those views were not as spectacular as the view to the west looking into the setting sun. This evening I was part of a discussion on Newstalk with Ivan Yates and David Quinn on religious freedom and toleration. I cited recent examples I have seen on the streets of Limerick of Buddhist monks walking in a line along O’Connell Street in their saffron robes and Muslim women in traditional scarves as indicators of pluralism and diversity in Ireland today. We have moved a long way in Ireland from the ‘pogroms’ in Limerick in the early 20th century that deprived the city of the presence of a vibrant Jewish community, or the intolerance in the south-east in the 1950s that was expressed in the Fethard-on-Sea boycott. In reflecting on the mistakes and the extremism of the past, we can learn to value some of the freedoms we have today. But during the day, I have been preparing in advance resources for preaching and liturgy for the Feast of the Presentation (2 February) and the Fourth Sunday of Epiphany (4 February). They are words not only about the beauty of light but a reminder of the need to celebrate the diversity and pluralism we enjoy in Ireland today. The jury may still be out deciding whether Charles Darwin was an agnostic or a questioning Christian. But there is no doubt that he took a deep and detailed interest in the affairs of his local parish church, Saint Mary the Virgin, Downe, in Kent. Darwin was so keen to ensure that the parish was run properly by competent and moral Anglican priests that he became embroiled in the debates about the personal lives of not just one but two Irish-born curates in the parish. The debate was so intense that both Irish priests were sacked within months of each other 150 years ago, in 1867 and 1869. Charles Darwin (1809-1882) has been claimed by atheists, agnostics and Unitarians alike. But he was baptised in Saint Chad’s Church of England parish church in Shrewsbury, and as an undergraduate at Christ’s College, Cambridge, he originally intended to be ordained in the Church of England. I had always cherished what I once thought was a distant family kinship with Darwin, although I now know that while Darwin’s grandfather, Erasmus Darwin lived in Lichfield, the connection between Darwin and Comberford Hall is both remote and obscure. Darwin was 33 when he and his young family moved in 1842 to Downe, a rural village south-east of London, with a population of about 500. David Kohn, in The Darwinian Legacy, suggests the innovative Irish agriculturalist, Canon William Hickey (1788-1875), who wrote under the name of ‘Martin Doyle,’ may have been the curate of Downe when Darwin moved there in the 1840s, working with the vicar, the Revd John Willott. But this is not possible, for Hickey had been Rector of Wexford in 1832-1834 and then Rector of Mulrankin, Co Wexford, for the rest of his life, until he died in 1875. Charles Darwin, as a landowner, and Willott’s successor, the Revd John Brodie Innes, as the local vicar, became the two key figures of authority in village life in Downe. Together they served on various committees and church-funded groups, including the National School, the Sunday School, and several charities for the poor. Darwin’s faith was severely challenged by the tragic death of his 10-year-old daughter Annie in 1851. He stopped going to church, although his wife and children continued going. While Darwin lost his own faith in the Christian religion, he still supported the church and its activities, remained on the local school committee, took a keen interest in the church organ, and continued to contribute throughout his life to the work of the South American Missionary Society. Although Darwin had stopped going to church, the church was the linchpin of rural society, and a man in his position could hardly avoid contact with it. Innes and Darwin were close friends and their letters, published by the Darwin Correspondence Project, show how they worked together closely to preserve the church for the sake of the community. Their friendship continued despite the reaction in many Church circles when Darwin published his theory of evolution in 1859 in On the Origin of Species. However, when Innes inherited land in Scotland in 1862, he left Downe to live in Scotland, where he was appointed to a number of Church offices. However, he remained the nominal although absentee Vicar of Downe until 1869. To fulfil his duties in Downe, Innes appointed a curate to look after the parish. It was an arrangement that worked smoothly until the Revd Thomas Sellwood Stephens left for a parish in Cornwall in 1867. The Revd Samuel James O’Hara Horsman, a graduate of Trinity College in Dublin, applied for the vacant position of curate. Innes distrusted Horsman, but he gave way to the ‘universal judgment in his favour’ at Downe and appointed him. Horsman had graduated BA from Trinity College Dublin in 1857, but was ordained deacon the following year in the Church of England and priest two years later in 1860. He was appointed Curate of Downe on 2 August 1867. Within weeks, Horsman had left the parish for an extended holiday without giving notice, and dissatisfaction with him began to mount in the parish. Horsman wrote to Darwin from a friend’s house in London to defend his absence, complaining of ‘wretched & miserable lodgings at Downe’ and about his low pay. Darwin wrote to Innes at once about Horsman’s erratic behaviour. Innes suggested that if Horsman did not resign, he would recommend that that the Archbishop of Canterbury should dismiss him. Innes now realised it was difficult if not impossible to run the parish from afar. He offered to sell his advowson, or the right to appoint the Vicar of Downe, to Darwin. Horsman resigned on 10 November 1867. He had lasted in Downe for barely three months. Following Horsman’s resignation, Innes took time in appointing another curate. The Revd John Warburton Robinson was a close contemporary of his predecessor: he had graduated BA from TCD in 1857 and was ordained deacon in the Church of England the following year, and priest two years later in 1860. Innes appointed him to Downe on 30 August 1868. His questions and doubts were well-founded, for not long after Robinson left for Ireland, and he remained there for three months. By now, it was obvious, Innes too was testing Darwin’s patience. When Robinson eventually returned to Downe from Ireland, he became the centre of yet another scandal. Darwin reported to Innes rumours that Robinson had been seen ‘walking with women after dark,’ there were reports of misconduct with a maid, the villagers stopped going to church, and contributions to church-run charities and initiatives were in danger of drying up. The gossip was too much for Robinson too, and he left Downe, resigning on 4 February 1869. He had been curate of Downe for little more than five months, of which three months had been spent in Ireland. Darwin celebrated his 60th birthday a few days later on 12 February 1869. After all his efforts to save the parish of Downe, Darwin’s close involvement with the parish and the church would soon come to an end. A new vicar, the Revd George Ffinden, arrived in 1871 and was intolerant of Darwin, his wife Emma (Wedgwood) and their daughters. Darwin’s family soon stopped going to Downe Church, although Darwin continued his charitable work in the parish. Meanwhile, whatever happened to the two Irish-born curates, Horsman and Robinson, after Darwin had ensured they were sent packing from Downe? Horsman eventually moved to London, where he was the curate in three parishes – Saint Luke’s, Marylebone, Saint George the Martyr, Southwark, and Saint Mark’s, Regent Park – before eventually moving to a parish in Gloucestershire in 1884, where he died around 1887. Robinson was a curate in two other parishes in Kent before moving to a parish in Northamptonshire, and then moving to Melbourne in Australia in the 1880s. 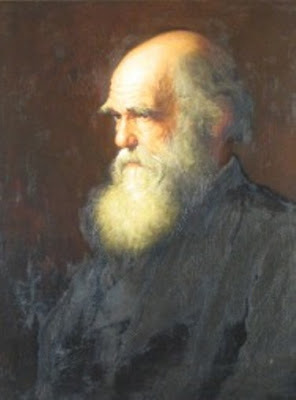 Darwin died at Down House on 19 April 1882. He had expected to be buried at Saint Mary’s Church in Downe, but at the request of his colleagues he was buried in Westminster Abbey on 26 April 1882. But there is one other interesting Irish connection with the parish church in Downe. The east window was installed in 1950, at a cost of £720 that was met by the War Damage Commission. It is the work of the Irish stained-glass artist, Evie Hone (1894-1955), who was the winner of the competition to design the window. Her work was highly regarded by Robin Darwin, the great-grandson of Charles Darwin, who at that time was Principal of the Royal College of Art. The window depicts the Crucified Christ between His mother and Saint John the Beloved Disciple. The four lights above show the evening of Saint Peter’s denial, the instruments of scourging and mockery, Judas Iscariot’s betrayal and the Crucifixion.